Disney has released a new clip, featurette, and provided us with an exclusive TV spot from director Andrew Stanton‘s John Carter. The film stars Taylor Kitsch as the eponymous hero, a Civil War veteran who’s transported to the surface of the moon [Correction: Mars, not the moon. I personally blame Disney for removing “of Mars” from the title] and thrown into a new battle between warring tribes. This new clip and the featurette finally provide what I’ve been looking for in the story: scope. Even on my computer monitor, the film finally seems bigger with diverse settings and set pieces. I assume Disney held off on showing this stuff because the effects weren’t completed, because this footage would have been worth the Super Bowl ad-time. Hit the jump to check out the clip, the featurette, and an exclusive TV spot. The film also stars Lynn Collins, Mark Strong, Samantha Morton, Thomas Haden Church, and Willem Dafoe. 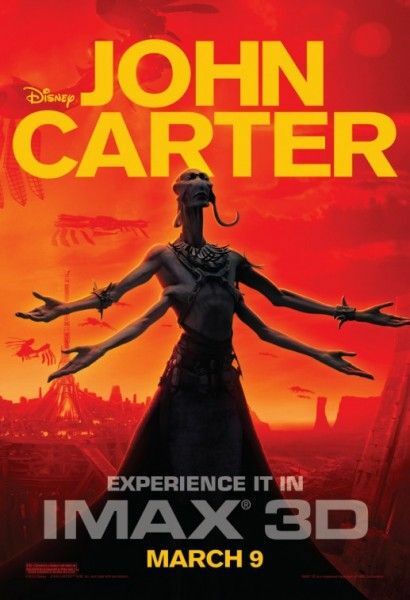 John Carter opens in 3D on March 9th. For more on the film including my set visit and on set interviews with the cast and Stanton, click here. Also, we just posted 95 high resolution images from the film here.